I’ve always thought that song was a little harsh. I mean — we all try things that don’t work out, right? No need to be rude, Dream Angel. 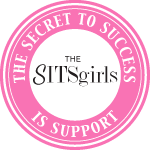 A lot has been going on behind the scenes here in Beauty School Dropout Land, and I’ve decided that it’s time to take a break from blogging. I don’t know if this will be goodbye forever, but for now — it’s time. Between my family, my job, a too-long commute, volunteering at church and lots of other hobbies, I just don’t have a lot left over to give to this blog. And I don’t ever want to feel like I’m phoning it in or writing out of an obligation. I’ll still be around, reading my favorite blogs, commenting when I really have something useful to add to the conversation, and posting pictures of my kids, my knitting and other assorted nonsense on Instagram, and hopefully spending a little more of my time and mental energy on the people in my immediate circle of family and friends. Now I’ve called the shot, get off the block, I really gotta fly! This is one of the best meditation techniques for beginners. Ancient, powerful and effective, by simply watching your breath, you give your mind something to focus on in a relaxed way. Get yourself in a comfortable position, close your eyes and begin to observe the sensations of breathing. Pay attention to how it feels as you draw air in through your nose, down into your lungs and back out again through your mouth. You don’t need to control or force your breathing in any way. Just watch. If your mind wanders — and it will — don’t worry or criticize yourself, this is normal in the beginning. Gently bring your attention back to your breathing and continue. This type of meditation allows you to be fully present in the moment by bringing your attention to the sensations within your body. Start by focusing on your breath then allow yourself to become aware of other sensations — how you’re sitting, where you feel tension or tingling or ease. The goal here is to become a neutral observer. Try not to analyze or judge anything you experience or any thought that passes through your mind. Simply observe. The ancient Sanskrit word, “aum” is a mystical syllable often used in chants or as a meditative mantra. By repeating a sacred word or meaningful phrase (including short affirmations) you can bring your mind to a state of focused tranquility. You can say the mantra aloud or repeat it silently. If sitting still for too long makes you squirm, try the walking meditation technique and the singing bowl meditation. You can do this just about anywhere, although a garden or other pleasing environment is ideal. Simply focus on your body as it moves: your arms as they swing, your legs as they lift and extend, your feet as they rise and touch the ground. As with all meditation techniques, when you find your mind wandering, gently bring your attention back to the movement. Try not to judge, just observe the sensation of walking. This meditation technique allows you to be aware without any specific focus. Simply sit quietly with your eyes closed and allow thoughts to float freely in and out of your mind. As they come and go, observe them without judgment or attachment. During my junior year in college, I studied abroad in Pamplona, Spain. I didn't have any particular love for Pamplona, Hemingway, bullrunning, or even Spain in particular, I just wanted to go somewhere to practice my Spanish. After going over all the options with my parents, they ruled out Mexico and Central America as too dangerous and the beach towns of Spain as too fun, so north-central Spain in where I ended up. If I were to do it over again, I would go to either Barcelona or Valencia, but Pamplona was probably a pretty good place for me to go, since it was a relatively small city for me to learn to navigate, as compared to Madrid or Barcelona. I don't have any particular desire to go visit Pamplona again (although I did see the running of the bulls while I was there – and NO I DID NOT RUN, ARE YOU CRAZY?!?!) but I really want to go back to Spain. The last time I was there was on my honeymoon several years ago, but I have plans to hopefully go back in 2010. In the meantime I have to get my Spain fix through cooking, travel books, Almodovar movies, anything with Penelope Cruz, and even that horrible travel series on TV with Mario Batali and Gwenyth Paltrow. Thank goodness my husband discovered Made in Spain, a cooking show on PBS that is hosted by Jose Andres, a Spanish chef who is famous for his crazy chemistry experiments with food (like, he will turn liquids into gels with weird chemicals and serve a bowl of chicken soup blobs instead of regular soup.) Luckily, on the show he mostly just visits different regions in Spain and shows their regional delicacies and tourist attractions. My favorite is when he recreates traditional Spanish dishes (and provides recipes). 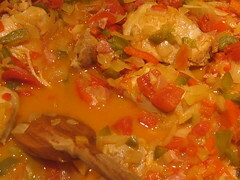 The last episode I saw featured the region of Aragon and had a recipe for a traditional chicken dish called Pollo al Chilindron (chicken with lots of peppers) (bell peppers and smoked paprika, that is – Spanish food is not spicy at all!) I made it last night and it was really yummy – the only bad thing was that it took almost 2 hours!! I went for a jog around the neighborhood while it simmered for the last hour. Here's the recipe – cross-posted from Jose's website. Chilindron is a wonderful vegetable stew that comes from Aragon, where they grow astonishing vegetables in the fertile land near the Ebro River. Heat 1 tablespoon of the olive oil in a 12-quart pot over medium-high heat. Season the chicken pieces with salt then, working in batches, brown them on all sides. Transfer the chicken to a platter and set aside. Add the ¼ cup of olive oil to the same pot, and when the oil is hot, add the onions and peppers. Reduce the heat to low and cook slowly until the vegetables are dark golden brown, about 30 minutes. Add 1 tablespoon of water if the onions start to burn. Add the garlic and cook for 5 more minutes. Then add the white wine and cook until it evaporates, 4 to 5 minutes. Add the jamón and browned chicken pieces, as well as any juices that have collected, and cook for 5 more minutes. Stir in the pimentón, tomato sauce, rosemary, bay leaf and the water and simmer over low heat for 1 hour or until the meat starts to fall off the bone. Season to taste with salt before serving. Whenever I find multiple balls of nice yarn on the sale rack at my LYS, I start dreaming of all the little projects I could make with them – vests, nice big scarves, baby gifts, etc. I rarely actually follow through on these wild schemes, but! there is an exception to every rule. 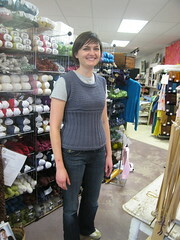 A quick little knit in the round vest pattern doesn't hurt my chances, either. I will probably wear this over a dress shirt more often than a t-shirt, but I wanted to take an FO picture and it really doesn't look too bad, either. Knitting specs are on ravelry. Well, it will be busy, but it's all things I love to do, so it should be great. Okay, after about a million people tagged me with this meme on facebook, I am finally giving in. Here goes! 1. I am terrible at making mixed drinks. It's one of those things I'm really glad my husband can do well. 2. I've had 3 pets in my life: Lucy, Hermie, and Superman. Can you guess which one was not a hermit crab? 3. I wish I had taken some business classes in college. A bit more physics/science/engineering wouldn't have hurt, either. Despite my decidedly anti-math college courseload, my co-workers seem to think I am a "quick study" when it comes to these things. I'm really just a good faker. 4. I wish I was taller – about 6 feet would do the trick. 5. American Idol and So You Think You Can Dance are my guilty pleasures. 6. I never expected to be a pastor's wife. 7. I almost never knit the same thing twice. 9. I love to cook and make things the old-fashioned way. It makes me feel very connected to my grandmothers. 10. My favorite TV show is 30 Rock. 11. My favorite podcast is RadioLab. 12. I love being a part of a CSA (community supported agriculture), but I am a bit challenged by all the turnips. 13. I am making a quilt for a king-sized bed. Sometimes I am a little bit crazy. 14. I have competed in 2 sprint triathlons, 5 half-marathons, and countless 5Ks and high school track and cross-country meets. 15. At one point I held 3 track records at my high school. They posted the record-holders names on the wall in the gym – it was pretty cool. 16. I think my favorite food in the whole world is tortilla chips. I think it may be genetic. 17. I get absurdly excited about meeting "blog friends" in real life. I am going to visit Kelli next month and it's going to be so much fun! 18. I've been blogging off and on since 2003. 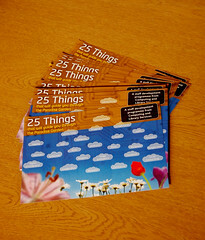 Back then it was a law student blog that no one read. Most of it is pointless crap but it's the only journal I've ever kept and I really like going back and reading what I was doing back then. 19. If I could live anywhere in the US, it would probably be Colorado. If I could live anywhere in the world, I would live in Barcelona. 20. I am a terrible housekeeper – but I think I'm still better than my sister. 22. I still don't really know why I became a lawyer. It really doesn't fit with my personality at all. 23. I don't have any tattoos. Whenever people try to tell me I would like to have one, I tell them that I don't even put bumper stickers on my car. 24. I kinda wish I still played the clarinet. I was pretty good. 25. I love polka dots. 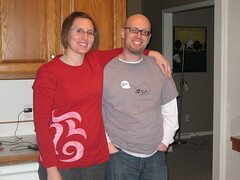 Did I ever blog this cute maternity shirt I made for my sister? I don't think I did! Well, I didn't actually make the shirt, just the decoration. 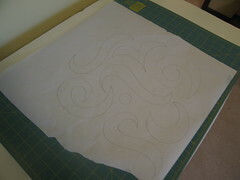 Then I cut out the shapes with an exacto knife and ironed it down. 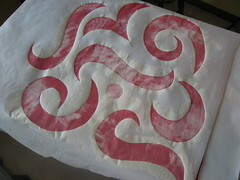 Paint with fabric paint…. I found some a brand at Jo-Ann's called CeramCoat that lets you mix any color with some stuff called "fabric medium" and make fabric paint in any color. 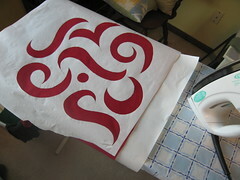 I could only find a basic maternity shirt in red, though, I so figured I'd keep it simple with white paint. I couldn't get the paint very even, so I figured I'd go with the blotchy/weathered look. I followed the directions on the paint bottle to set the paint, and voila! Custom-made cute maternity shirt for my sis. 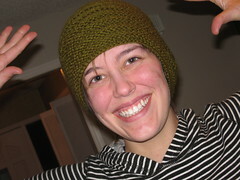 My friend Alexandra finished her very first hat this week! Doesn't she look happy? It is a Christmas (2008, but who's counting?) present for her dad. We got together last Friday night and I helped her finish up the decreases. She ended up making the "ribs" run horizontal instead of vertical, which was what I was thinking when I was giving her instructions via text message several weeks ago. It was quite funny, because while we were finishing it, she was telling me that she would NEVER be able to design a knitting pattern on her own. But… she picked the yarn and needles, she picked the number of stitches, she picked the design… sounds like a designer to me! Nice, eh? And just a little bit crazy. 1. 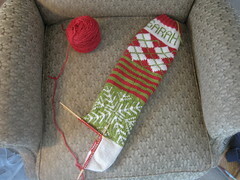 I want to knit the New Ancestral Christmas Stocking from Mason-Dixon Knitting. 2. 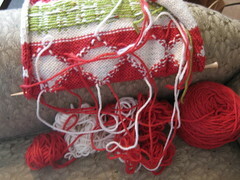 I cannot leave well enough alone and just knit a pattern as written. 4. 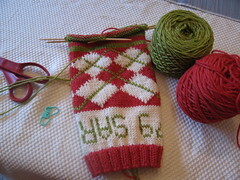 I have no clue how to do intarsia. 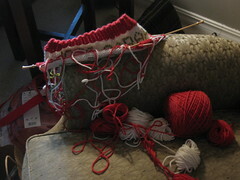 Also, I have an extreme aversion to yarn tangling while I'm knitting. 5. I'm beginning to think this wasn't such a hot idea after all. One more attempt, and then maybe I'll research a better way to deal with those long floats.